Bureau 13: Stalking the Night Fantastic ("B13") was not a paragon of game or graphic design. It wasn't a carefully crafted game with a thoughtfully balanced system presented in a full-color, glossy package with evocative, consistent artwork. In short, it wasn't (and still isn't) a high-quality, modern product. B13 is (and was) a nifty idea that was years ahead of its time, packaged in the bundle one would reasonably expect from a small publisher in the dawning age of role playing games. 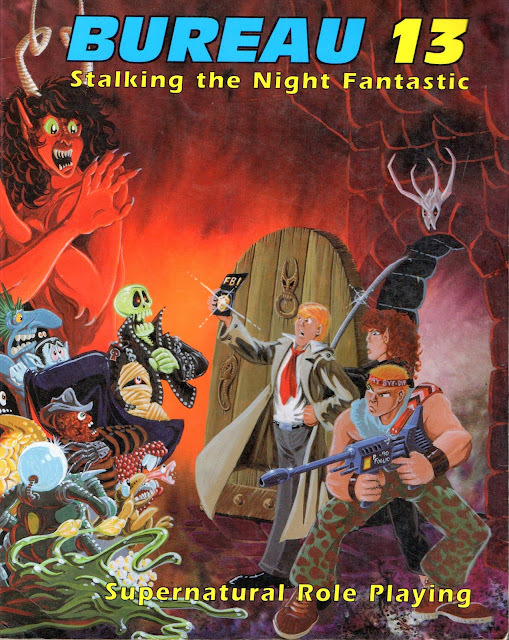 Bureau 13: Stalking the Night Fantastic 3rd edition, 1992 printing - w/ awesome Phil Foglio cover! B13 first saw print in 1983. Granted, by this time companies like TSR and Chaosium were starting to produce more mature games in more professional packaging. But it was still the first decade of RPGs, and there were a lot of small companies trying their hands at game design and publishing. Tri Tac Games (which was born in 1978 and originally called "Tacky Tack Games") was one such company, and they produced a plethora of creative board and role playing games. The game pits normal folks who have encountered (and overcome) supernatural evil - and subsequently been conscripted into a clandestine government organization - against all manner of ghoulies and ghosties. Preceding The X-Files, Delta Green, The Laundry, and Supernatural by years, it is truly safe to say that the game - concept-wise, at least - was far ahead of its time. I was introduced to B13 in 1989, during my first real game group's immersion into horror/supernatural role playing (via Palladium's Beyond the Supernatural). A couple members of the group had a copy of the second edition of the game, and we borrowed from it the hit location tables for use in our existing game. I was always intrigued by the concept of B13, though, and when the third edition showed up on my FLGS's shelves in 1990 (with that nifty Phil Foglio cover no less! ), I snapped it up. Since that day, I've played/run more games of B13 than Dungeons & Dragons, Call of Cthulhu, and Beyond the Supernatural put together. 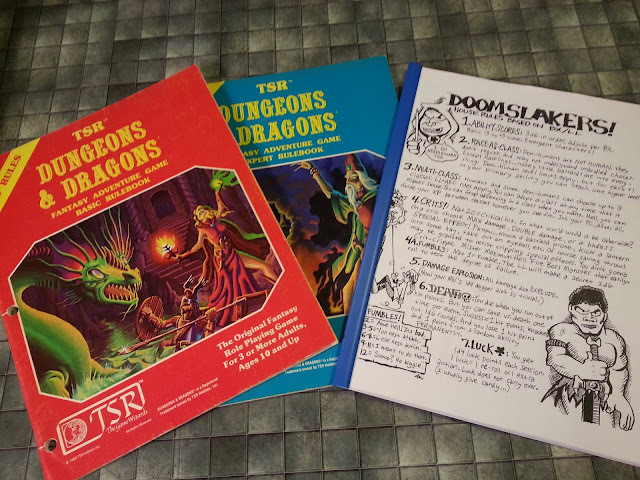 The attraction wasn't the physical packaging - the book looks like it was laid out in an early version of Microsoft Word and it was illustrated in a super tongue-in-cheek manner, with most of the art being very typical of an early RPG, and some appearing to have been penned by someone whose artistic career seems to have consisted primarily of doodling on napkins. Nor was it the game system - the idea of a single, cohesive game mechanic hadn't yet pervaded the RPG industry, and much like other early RPGs, B13 is a collection of subsystems, with different approaches to core abilities, skill resolution, and combat. Nor was it the game's simplicity - it's a crunchy game, with rules for everything from electrocution to radiation exposure to how the length of a knife affects its damage. Nor was it the game's completeness - some of the rules, especially regarding skills and spells/psionic powers, are so vague as to be nearly useless. To be honest, what drew me to the game was all of its apparent shortcomings. I know, that probably sounds counter intuitive, but the game struck a chord because it felt like an amateur production. It was approachable, unlike more "mature" games. It felt like a toolkit, something we could take and twist and turn into our own game, unlike those others, which were more polished and invited less customization. Our group, and myself, especially, were very much tinkerers and in B13 we saw a game that presented a prefab framework that was almost begging for us to take it and make it our own. That's always been the allure of less "mature" games for some people, as well as the reason others stay away. Somebody else must have recognized the gem under the rough crust, as B13 won the Gamers Choice Award at 1991's GenCon for Best Fantasy Game. Given the other games that were coming of age or being born at that time, I'd say that alone speaks volumes about the hidden charms of Richard Tucholka's little game of government-sanctioned monster hunters. In all, Bureau 13: Stalking the Night Fantastic is a game packed with as much greatness as it is with the typical shortcomings of the small press games that arose during the Dawn of RPGs. And it's the game's warty appearance that also makes it an unpolished gem of that era of gaming. It's definitely a game that's worth a look, if not an actual play. Bureau 13 wasn't as much as great game for its system as for its content. As mentioned above, the concept of a government agency chasing after the supernatural, eliminating threats to the public and more importantly ERASING ALL KNOWLEDGE OF ITS EXISTENCE was a cool idea and way ahead of its time. Frankly, we took Bureau 13 and adapted it to other game systems, and it was wacky and outrageous fun. Sounds like your experience w/ Bureau 13 was pretty similar to mine!